Hot flashes, night sweats, mood swings, insomnia…sounds like a nightmare doesn’t it? Unfortunately though, fifty percent of the people reading this article will like experience these symptoms in their lifetimes, and possibly a few more. Of course, I’m referring to women experiencing the effects of hormonal changes in the body, be it premenstrual, pregnancy related, or menopausal, although for those women currently experiencing them, they might argue that nightmare sums it up much better. Women’s health is a wide ranging topic. While many men often complain that women are hard to understand, it is for good reason! A woman’s body is complex, undergoing many changes throughout life. In fact, even in health conditions that afflict both men and women, women often have different outcomes and risks than men do. So naturally, the question is what steps can be taken to minimize women’s health risks and what treatment options are available for the common conditions afflicting women? First there are the obvious answers. See your doctor yearly to get regularly scheduled checks such as Pap smears, reduce stress as much as possible, exercise regularly, and maintain a well-balanced healthy diet. However, rather than rehash what most women already know they should be doing, I’d like to address some of the more common conditions and complaints I get from women as a practicing pharmacist. By far and away the most troubling condition for women in my practice is menopause and perimenopause, the period immediately preceding menopause when hormone levels initially begin to decline. The decline, and ultimate discontinuation, of hormone production by the ovaries can lead to a host of symptoms that can wreak havoc on a woman’s quality of life. In addition to the hot flashes, insomnia, and mood swings, woman can also experience weight gain, decrease or loss of libido, vaginal dryness, and memory loss. To combat this, there are a few tools at our disposal. First there are over the counter supplements that can help in certain cases. For instance, rhubarb root extract, sold under the trade name of Estrovera®, is a great option to reduce hot flashes, one of the biggest complaints of menopause. This non-hormonal herbal extract has been used in Europe for over twenty years, and has shown in clinical studies to have comparable results to low dose hormone therapy. Other over the counter options that help to manage menopausal symptoms include evening primrose oil and black cohosh. Additionally, cortisol, our body’s hormone that helps us to manage stress, is often disrupted by the hormonal changes menopause presents, leading to issues such as weight gain, fatigue, and potentially hot flashes. Adaptogenic herbs such as eleuthero, ashwaganda and rhodiola rosea, commonly sold in combinations products like Adrenotone®, are highly effective at helping the body normalize cortisol levels, thus relieving these symptoms. 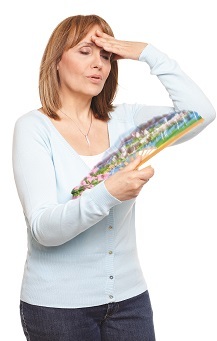 In the prescription realm, hormone replacement therapy (HRT) is another option to combat the symptoms of menopause. This type of therapy is highly individualized, as each woman’s hormone deficiencies and imbalances are different. For instance, while one woman may need estrogen, another may have too much estrogen already in their body and need progesterone to balance that excess. When customized properly to the individual’s needs and symptoms, the results can provide drastic improvements in quality of life. Additionally, while you may have heard of risks associated with HRT such as breast cancer and cardiovascular events, when the dosages and hormones of HRT are customized to each individual by a physician and pharmacist well trained and experienced in the field of HRT, the risks can be greatly minimized by administering the proper combinations in the proper dosage forms. A main distinction in hormone replacement therapy is non bio-identical hormones, such as medroxyprogesterone and conjugated equine estrogens, versus bio-identical hormones such as progesterone and estrogens like estriol and estradiol. The main difference between the two is that a bio-identical hormone’s chemical structure matches exactly to the hormones you already have circulating in your blood. In other words, giving your body a bio-identical­ hormone is giving it something it expects to have, and has had your entire life. Conversely, non bio-identical hormones vary in their structure and function from the natural hormones you have in your body, and your body does not have receptors designed to receive those hormones. In essence, taking a non bio-identical hormone is like fitting a square peg into a round hole. As you might expect, medical literature and data has demonstrated that using a bio-identical hormone tends to be more effective and have a better safety profile long term as compared to a non bio-identical hormone. While menopausal issues are significant, there are many other women’s health issues that I see in my practice. For instance, many young women experience trouble with premenstrual syndrome and the symptoms associated with it. While prescription drugs such as birth control can be effective at controlling those issues, over the counter supplements that contain herbs like chaste tree berry, wild yam root, and passionflower, are great options to support PMS naturally. Additionally, there are often concerns about what constitutes a good prenatal vitamin. Generally, you want to look for a prenatal vitamin that is comprehensive and provides an adequate amount of folate, preferably as methlyfolate, a readily active and utilized form in the body, as compared to folic acid which must be converted to the active form in the body and is done so poorly in some women who have certain genetic mutations. Additionally, look for a product that gives you a good amount of DHA, an omega-3 that supports healthy brain development in your baby. Try to get at least 400 to 500mg of DHA per day while pregnant or nursing. Finding the right healthcare professional to address your health is essential. Women are complex and sophisticated, and their health is no different. Seek out physicians and pharmacists that specialize in women’s health and have experience in the field. Compounding pharmacies such as Pine Pharmacy in Williamsville are great resources for both hormone replacement and vitamin supplementation to support a woman’s health from youth through the golden years.